European Automation Projects recently completed the delivery of a complete Truck Loading Package and Terminal Automation System(TAS) for the new Geos Group storage and distribution terminal at Port of Blyth. 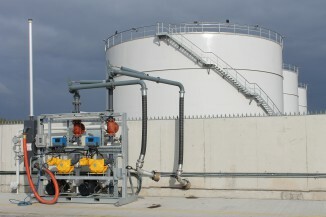 The terminal is a sea fed installation designed for the storage and distribution of Marine Gas Oil (MGO). As part of the package EA Projects delivered a 4” 2 arm tanker bottom loading skid for the delivery of MGO onto road tankers designed to deliver fuel at a rate of 1700LPM. The skid was provided as fully temperature compensated and provides throughput volumes to the host system in natural litres, standard litres and kilograms. The fully electronic skid is fitted Isoil Vega II flow computers which act as the main controllers for the batch delivery and also as the main driver interface. The company also supplied the electrical and mechanical design drawings for the skid and the associated installation as a turnkey package. System database containing operational and safety data for all drivers and vehicles using the facility. Stock accounting and reconciliation in natural litres, standard litres and tonnes including export of data to third party through-putter. Full audit history of all movements through terminal via reporting and trending screens.